Patients who received EBVs experienced longer hospital stays, but greater increases in FEV1 measurements. 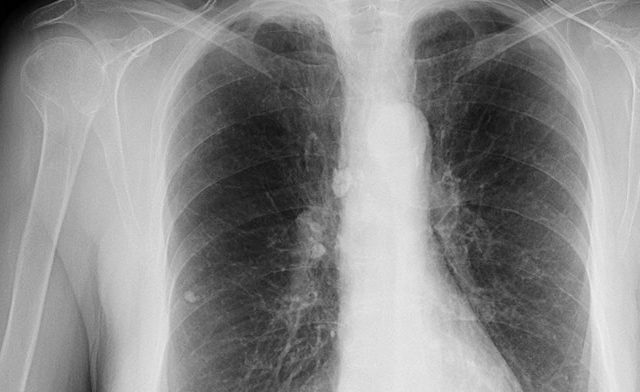 Improved lung function, decreased dyspnea, increased exercise tolerance, and improved overall quality of life may independently result from the placement of Zephyr endobronchial valves (EBVs) in patients with heterogeneous emphysema, according to a study published in the American Journal of Respiratory and Critical Care Medicine. Researchers identified 78 patients with heterogeneous emphysema deemed collateral ventilation negative and randomly assigned them to receive either EBVs (n=65) or standard of care alone (n=32). There were no significant differences in baseline characteristics, with the exception of those in the EBV group reporting worse respiratory-related quality of life (P =.042). A primary outcome of forced expiratory volume in 1 second (FEV1) improvement from baseline by ≥12% was assessed in both groups at 3 and 6 months, with a target lobe volume reduction assessed via chest CT at 3 months. Study results showed that, on average, 4 valves were implanted in 65 patients who received EBV treatment, with an average hospital stay of 4 days. Those receiving standard of care had an average hospital stay of 1 day. Patients in the EBV group demonstrated a 12% or greater improvement from baseline FEV1 (55.4%) compared with 6.5% improvement in the standard of care group (P <.001) at 3 months postprocedure; maintained results at 6 months were 56.3% and 3.2%, respectively (P <.001). At 45 days, 89.8% of patients in the EBV group showed target lobe volume reduction of at least 350 mL (mean: 1.09±0.62 L (P <.001). The investigators concluded that statistically significant benefits in lung function, dyspnea, exercise tolerance, and quality of life were demonstrated in patients who received EBV treatment for hyperinflation secondary to heterogenous emphysema without collateral ventilation. Further, the treatment has an acceptable safety profile and is a beneficial treatment option over the current standard of care.